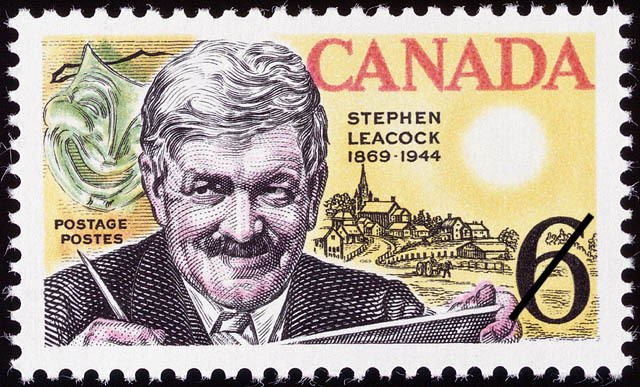 The value of a Stephen Leacock, 1869-1944 - 6 cents 1969 stamp depends on several factors such as quality and wear, supply and demand, rarity, finish and more. Values in the section are based on the market, trends, auctions and recognized books, publications and catalogs. This section also includes information on errors and varieties and characteristics. Stephen Butler Leacock, humorist, historian and economist whose writings brought him international fame, came with his parents to the pioneer farm lands of Ontario some 7 years after his birth on the December 30, 1869 in Hampshire, England. His humour shines through in later references to his birthplace as Swanmoor, a hamlet and parish on Waltham Chase, Hampshire; it doesn't say who chased whom. Leacock, one of a family of 11, died on the March 28, 1944 in Toronto where he spent 18 years commencing with 5 years as a student at Upper Canada College; he took his B.A. at Toronto in 1891 and Ph.D. at Chicago in 1903 after having been, in his words, examined for the last time and pronounced completely full. He was appointed the first lecturer of political science at Montreal's McGill. Prior to a memorable 32 years at McGill he served ten and one half years as a school teacher. The Literary characters created by Leacock carried the unmistakable imprint of the author. As an example of his geographic descriptions; everyone's small home town is epitomized in the Mariposa of Sunshine Sketches of a Little Town, a book widely regarded as typical of Leacock's style. As an author he referred to his own liquified loquacity and the general corrective of the humorous point of view. The half truth, he is reported to have said, is to me the mellow moonlight in which I love to dwell. Indicative of his point view was a pronouncement that he would rather have written Alice In Wonderland than the entire Encyclopedia Britannica. At one point in his career Leacock is said to have facetiously stated he was abandoning public lecturing because of a need to learn the Chinese language to gain a new audience; it is significant that ultimately many of his works, some sixty in all, were translated throughout the world. An unfinished autobiography The Boy I Left Behind Me, published posthumously in 1946, provides a remarkable insight into Leacock's recollections of his family life, his pioneer farm home some four miles from the south shore of Lake Simcoe in Ontario, and his transatlantic voyage to the new world aboard what he described as a grand old vessel combining steam with towering masts, a maze of ropes and a cloud of canvas. Of the final 30 miles of his journey in a horse drawn wagon he provides vivid descriptions of travel over corduroy log roads and through the thick swamps which were invariably the lot of pioneer farm settlers. Of his early school days, Leacock said it was a combination of thistles and caste which prevented him from being a barefoot boy at the Little Red School house.